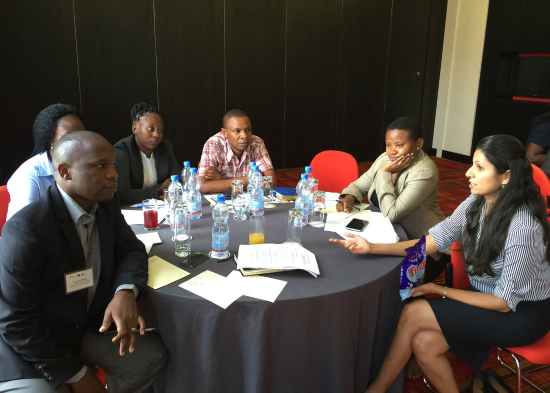 A group of Tanzanian lawyers, investigators, and government officials from the Directorate of Public Prosecutions, the Prevention and Combating of Corruption Bureau, and the Tanzania Police Force participated in a three-day training course on the effective implementation of financial sanctions and asset freezing measures in Tanzania. The course was convened by the Global Center and facilitated by an expert team with regulatory, investigative, and prosecutorial experience related to asset freezing, confiscation, and management. The three trainers—Mr. Gavin Durbin and Mr. Todd Harland of AML Solutions International, and Ms. Anagha Joshi, formerly with the Anti-Money Laundering Assistance Team within the Australian Attorney-General’s Department—focused sessions on international standards and best practices for detection, investigations of money laundering and terrorist financing, related Tanzanian legislative frameworks and regulations, and standards and mechanisms related to confiscation, asset freezing, and frozen asset management. Following the three day course, several attendees participated in a day-long beneficial interactive group exercise on the construction of money laundering schemes. This is the first in a series of trainings delivered in Tanzania under a broader Dutch-supported project to contribute to strengthening the anti-money laundering and countering the financing of terrorism regimes in Tanzania and Uganda. For additional information about the workshop or this project, please contact Ms. Danielle Cotter at dcotter@globalcenter.org.